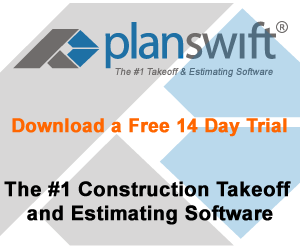 PlanSwift construction takeoff and estimating software calculates everything you need to get an estimate together, labor, square footages, perimeters, volumes of simple or complex areas, beams, rebar, studs, gallons of paint, concrete, insulation, gravel and length of copper wire (or anything in between). How is this possible? With PlanSwift takeoff software, you start by downloading the electronic blueprints directly from the planroom or practically any other digital plan right into the software.